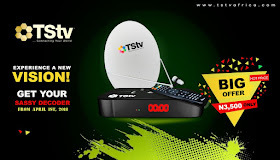 Many Nigerians already see TSTV as a failed project as the company has failed to kick off sales of its decoder after series of dissapointed dates. The company have made so many failed promises that a lot of people have eventually given up on them. But now, the African Telecom Satellite TV (TSTV) has taken to its social media page to announced its new decoder which is called "Sassy". The company initially said the decoder + remote+ the dish will go for N5000, but the price has now been dropped to just N3500 for the new Sassy which is pretty cheap. TSTV however didn't release any official statement regarding the free 20GB data on purchase of the decoder or free 10GB data when you make 1 month subscription. According to the information posted on TSTV official social media page, the new Sassy Decoder will go on sale starting from the 1st of April 2018. There is no word yet on the regions or states where the decoder will be available for purchase but we can only wait until next month for more information. We just hope the company keeps to their promise this time and doesn't add this to their list of failed promises and disappointments.